INDIAN government’s policy to regulate cotton exports to make it available for the domestic textile industry may affect farmers. In a decision that has cotton growers worried, the Centre on September 28 deferred cotton exports from October 1 to November 1. The registration of exports has begun and no duty will be charged for the 935 million kg (5.5 million bales) that would be allowed to be exported. Cotton export was banned for six months beginning April this year. The announcement had an immediate effect. 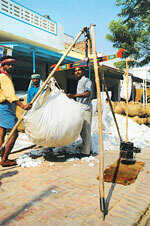 The domestic price of cotton which had increased from Rs 23,000 per candy (356 kg) in April 2010 to Rs 41,000 per candy fell to Rs 36,000 as news spread that processing of export contracts has been deferred, an official of the Cotton Corporation of India said. Farmers associations accused the textile industry of trying to stall cotton exports to protect its interest. P C Reddy of the Consortium of Indian Farmers Association said cotton crop has more export potential and is in high demand when compared to spices and other farm produce. “But keeping a tab on quantity of export to protect local industry would put farmers at the receiving end. They would not be able to bargain for good prices,” he said. India’s cotton production in 2010- 2011 is estimated at 5.53 million tonnes, a 10 per cent increase over the output in 2009-2010, according to India’s statement on cotton submitted to the International Cotton Advisory Committee that met in the US in September-end. Farmers said the increase in production will not help them because of the cap on export. “Capping creates fear and price fluctuation in the market, leading to panic,” said N M Sharma, managing director, of the Gujarat State Cooperative Cotton Federation Limited. He added state cooperative marketing federations and state agencies should be given export contracts. “When export goes into private hands, farmers fail to reap the benefits.” He said the deferment of export would make little difference to the prices as harvest has been delayed due to rains. But if the government postpones the date of exports further, farmers would incur heavy losses owing to price fluctuation, he said. India is expected to account for most of the increase in global cotton mill use in 2010-11, a recent statement of the International Cotton Advisory Committee said. It added that a record crop and limited exports could boost cotton consumption by 8 per cent to 4.6 million tonnes in India. Confederation of Indian Textile Industry (CITI), chairman, Shishir Jaipuria said the industry was ready to pay international cotton prices to Indian farmers. He said the industry only wanted to curtail speculation in the domestic market. “Announcement of exports from November 1 has already resulted in increase of cotton prices by over Rs 500 a candy, he said. Situation will worsen if exports are not closely monitored and restricted to surplus produce,” he added. Jaipuria pointed out that November 1 was too early to permit cotton exports as there were uncertainties due to excessive rains. “It should be deferred till January 1, 2011. By that time we will get a clear picture of cotton available,” he added. CITI secretary general D K Nair claimed farmers are not directly affected by exports as it is the traders who export cotton. “The so-called farmers’ campaign to allow free cotton exports is influenced by a group of traders who have the backing of the agriculture ministry and are seeking support in the name of farmers,” he said. Justifying CITI’s demand to extend cotton export date to January 2011, Nair said import of cotton takes time and increases cost by way of freight insurance and customs handling. When there is demand and jobs in the domestic market, export can be delayed, he said. N D Reddy, an activist with Hyderabad non-profit Chetana, said the farmers fears were real. Last month in Warangal district of Andhra Pradesh, market price for cotton was Rs 4,319 per quintal (100 kg) when farmers did not have stocks and government’s minimum support price was about Rs 3000 per quintal. Once the crops start arriving, the glut combined with the cap on exports is likely to cause prices to fall. Farmers don’t make profits if they get less than Rs 4,000 and the industry does not profit if it has to pay more than Rs 4,000 for raw cotton, said Reddy. so what does that last sentence mean? Then how come the Fairtrade Labeling Organisation (www.fairtrade.net) put the minimum support price at Rs 2500 ? ?